If you’ve been searching for a high-quality CIJ coder, PrintJet’s selection of KGK small character inkjet printers might be just what you need. KGK’s CIJ coding equipment offers our customers a reliable and long-lasting printing solution that fits in well with our goal of providing top-quality industrial printing solutions. 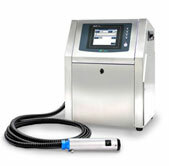 The KGK product line of CIJ printers combine the best features from all CIJ printers in the industrial coding industry. CCS3100 first nozzle in industrial coder history to use fluorine material eliminating nozzle contamination an ensuring printing stability! Built-in pictures, charts and graphs for instructions on how to add and edit messages as well as printhead and printer preventative maintenance reduces training costs and production errors with operator/maintenance turn-over. All KGK’s CIJ printers are CE certified, IP65 dustproof compliant for harsh environments, and all electronics are ROHS compliant. Continuous inkjet (CIJ) printers are among the most commonly used printers in the industrial marking and coding industries. PrintJet Corporation’s line of KGK coders are quality CIJ printers, also known as small character printers. KGK’s CIJ coders are easy to install, extremely easy to operate and capable of printing on a wide variety of surfaces and substrates. CIJ printers are ideal for fast production lines. They offer a non-contact form of high-speed coding that can deliver great results on any surface, including uneven or curved surfaces. CIJ printers primarily are used for coding on products and primary packaging. CIJ coders are used by many industries, including the food & beverage industries, pharmaceuticals, manufacturing, plastic & metal extrusion, cable manufacturing and many retail manufacturers. CIJ printers can print expiration dates, manufacturer lot numbers & dates, product specifications or other variable information. Our KGK line of CIJ printers are compact with a small footprint, which makes it easy to move and set up. 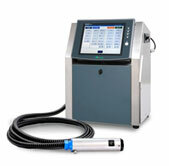 KGK CIJ printers can be calibrated in 15 minutes or less. KGK’s CIJ coders also can print up to 6 lines of print in 7 different fonts & multiple languages. KGK CIJ printers offer a wide range of character print sizes & inks for various applications. In addition, KGK printers are compatible with dye-based or pigmented ink or pigmented versions for printing light codes on dark surfaces. No matter what your requirements might be, PrintJet can provide a CIJ printer that meets all of your needs. We also offer expert knowledge in system integration and automation. Contact us today to learn more about our small character KGK CIJ printers. 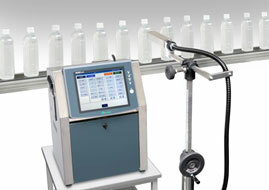 PrintJet has continuous ink jet printers for your small character, primary packaging marking applications.